On the night He was betrayed, Jesus took a towel and basin and taught His Disciples a profound lesson. Before their meal, before their celebration of Passover, before He took bread and wine and said “this is My body and blood,” Jesus washed feet. He wanted to demonstrate that in order for His friends and followers to be great, they must be servants of all. It was a gross job. These feet were dirty in ways most of us could not imagine. These were feet that came out of well-worn sandals… feet that walked hot streets… streets that doubled as open sewers for both men and beasts. It was expected that feet would be washed before a meal; they were filthy and stinky… and dinner tables were much closer to the floor in those days. But foot washing was reserved for the lowliest of servants, not the Master. If Jesus showed up at one of our churches today, we might expect Him to want to teach the same lesson. But I doubt that Jesus would walk into the church building, grab a towel and basin, and head to the pastor’s office to wash feet. Some Christian traditions still do ceremonial foot washing. It can be a powerful symbol that commemorates what Jesus taught and demonstrates servant leadership; I’ve witnessed such a service a few times, and it was meaningful. 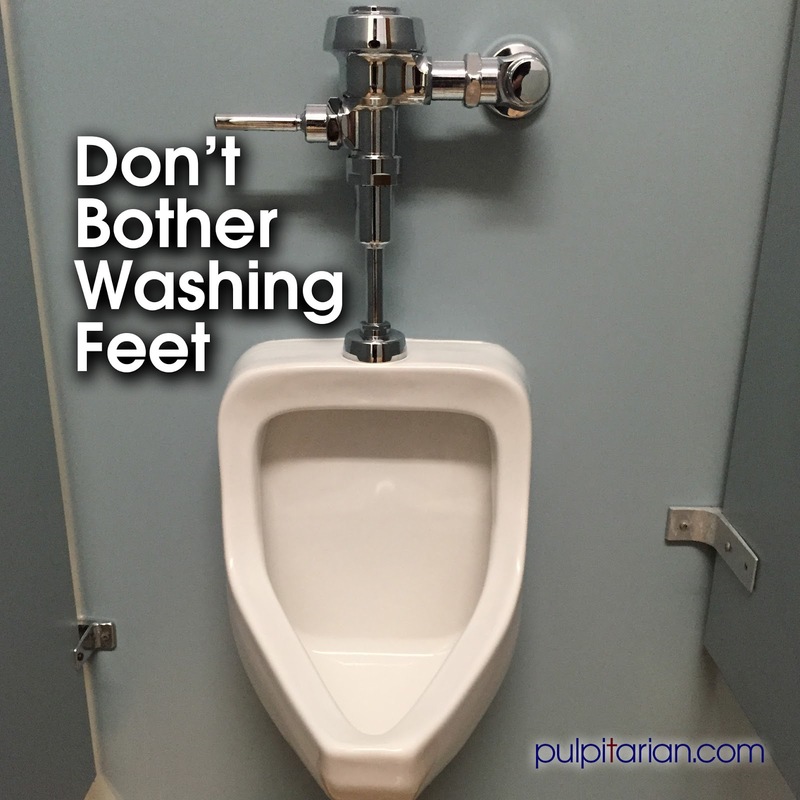 But let’s face it… washing a couple of feet these days, in our culture, really isn’t that big of a deal. Most feet get washed at least once a day, and then they are placed in clean socks and clean shoes and walk relatively clean streets. There might be a bit of foot odor, but it is nothing close to what Jesus dealt with. I’ve often enjoyed stinkier cheese. Most urinals stink; in my experience, church urinals are often among the stinkiest. I’m not sure why that is. It could be that church bathrooms are often old, often cleaned by volunteers or the lowest bidder, and often left to the bottom of the list when it comes to spending money. There are many excuses when it comes to stinky urinals; I’ve heard lots of them, including: poor ventilation, old fixtures, low water pressure, or not enough urinal cakes (who decided to call them “cakes”?). Truth is… if urinals stink it isn’t likely due to ventilation or water pressure or urinal cakes; urinals stink because of urine. There is no quick and easy way to clean a urinal; a once over with Windex is a waste of time and energy. And you can’t do it from a safe distance with a brush on the end of a long stick. Much like washing feet in the days of Jesus, cleaning a urinal takes some expertise and it is an up-close-and-personal experience. Check it out on the Internet; there is a science to urinal cleaning. It usually requires at least three cleaning agents: a disinfectant for the bacteria, an acid to break the minerals, and an enzymatic to get the proteins. But if you do it right, even the stinkiest case can be conquered. So… for us stinky urinal cleaners (whether literal stinky fixtures or figurative stinky jobs), take heart. Do the work and learn from Jesus. Attention to such details might play a part at winning some, and will (at the very least) build our own character (the stuff theologians call sanctification). Good job cleaning. Really good job thinking and writing about it.